My paintings are basically silent statements that should not require any explanation or narrative. They’re mostly about the character of the visual elements – line, shape, color, texture and value – and how they interact. They’re also about references and allusions that appear unconsciously and spontaneously as I paint. Once a painting is finished, I often find that it reminds me of places or events from my past. I paint intuitively as much as possible. A state of confusion is often embraced. I like the adventure that comes with not knowing where the painting process will lead me. Most aesthetic decisions I regard as tentative. I enjoy painting by trial and error, improvising and trusting my instincts to guide me, until I discover a painting that promises to be visually sustaining and feels authentic. East Asian calligraphy has inspired me for as long as I can remember. Why I find it so fascinating remains a mystery, but there’s no denying the influence. For me, each calligraphic mark or brushstroke has its own personality. It can be powerful or gentle, evocative or provocative. One part of a large brushstroke might dominate the background, while another part of the brushstroke might fade into the same background. In some paintings the background behind the brushstroke resembles a flat wall, while in other paintings the background is reminiscent of a seascape or prairie landscape. Perhaps what has inspired me most of all occurred when I was ten years old. In 1958 my family moved from Kingston, Ontario to live in a park-like setting near Victoria, B.C. For five years we lived on the grounds of Royal Roads Military College – now Royal Roads University – where my father was a teacher. 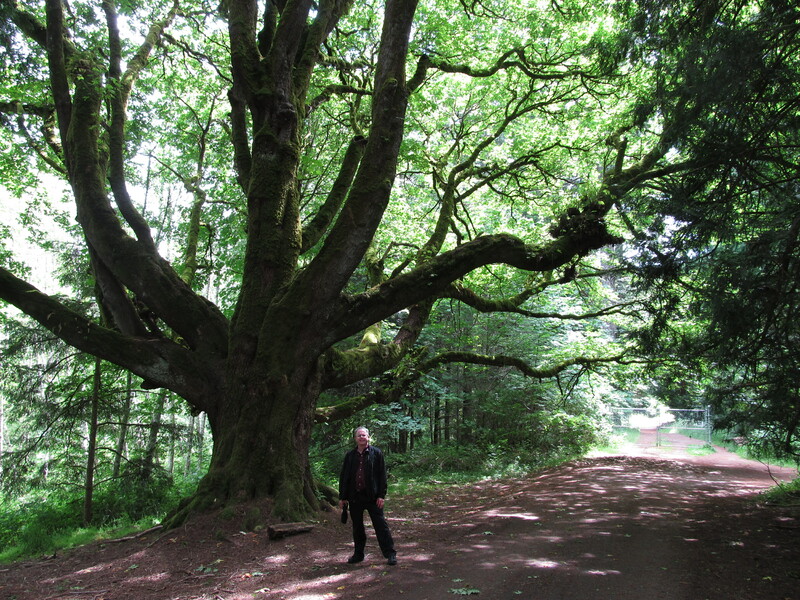 My playground was the old-growth forest and the Oriental Garden close to Hatley Castle. Along the beaches of nearby Esquimalt Lagoon I was fascinated by the range of textures, shapes and colors I saw in the rocks, driftwood, sand dollars, starfish, and Bullwhip kelp. When I visited Royal Roads in 2013, I was surprised to learn how deeply I’d been influenced by these childhood experiences. Upon returning to my Winnipeg studio, I found that these recollections of Vancouver Island had stayed with me. My childhood memories began to influence my painting: I painted more intuitively, experimented more with color and explored different ways to apply paint. The subject matter of my paintings now included memories of Royal Roads, the Esquimalt Lagoon and views of the Strait of Juan de Fuca with snow-capped Mount Baker in the distance. My painting is also inspired by the work of many abstract painters, especially Canadians Jack Bush, Douglas Haynes, Dave Cantine and Otto Rogers — as well as the American painters Robert Motherwell, Helen Frankenthaler and Hans Hofmann.